Update 4/5/19: The agreement cited below uses figures of $100 million, increasing transportation funding to $336 million, and is based on an agreement in the state Senate that hadn’t been voted on by the House. However, the transportation agreement in the Colorado budget was finalized as a $70 million increase to bring the total to $300 million. While there have been few reports on what programs or departments the increase of $70 million will come from, members have said education and higher education will be untouched. By all accounts, this should be a good year to be a member of the Joint Budget Committee (JBC) — a bipartisan, multi-chamber body in charge of writing the annual Colorado budget. The economy remains strong and state revenue for fiscal year 2019-2020 is projected to be up by $1.18 billion, or 9.5 percent. Even taking away for mandatory reserves, rebates, and required spending, appropriators were left with $624.8 million to spend. Time to solve all of Colorado’s problems from transportation to education, right? Wrong. 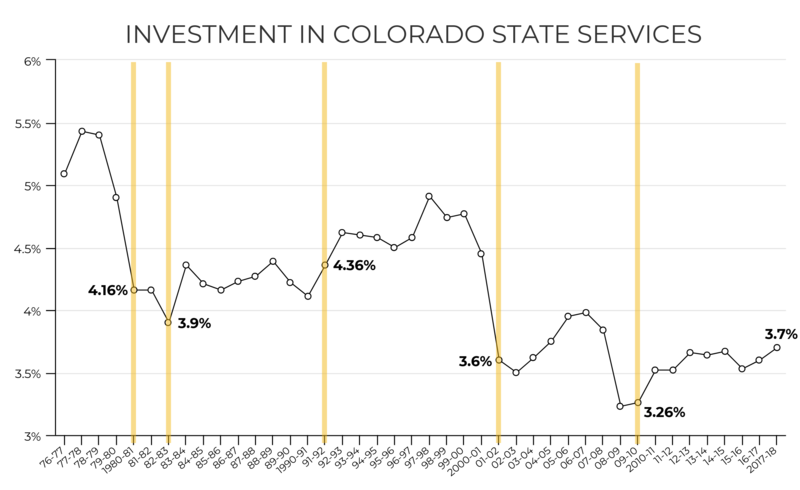 Even in the best years of economic expansion, the Colorado budgeting process is less a tale of our collective ability to invest in keeping Colorado competitive for generations to come, and more of a continued lesson in the limits of prioritization and the lasting negative impact of regressive Colorado tax policy. Keeping this in mind, Coloradans should still celebrate many of the great programs included in this year’s budget, particularly the full-day kindergarten proposal. The Bell continues to focus on economic mobility for all Coloradans. To that end, we appreciate the tough choices legislators made this year and highlight some of their great work to advance economic mobility below. We also emphasize areas where further steps could’ve been taken. Still, as always, the constraints are the headline of the story, as they make investing in Colorado’s long-term future near impossible. When looking at the Colorado budget, it’s easy to get lost in the particulars — which programs got funded and which didn’t — but it’s important to look at the bigger picture. As a state, we’re playing a constant game of catchup, hoping we can maintain unacceptable funding levels rather than make progress. Public investment continues to be extremely low and this budget is no exception. The graph below shows the share of General Fund revenues invested in state services over the years. Education funding is still way short of the Amendment 23 promise. Colorado is constitutionally mandated to increase education funding by “inflation plus 1 percent.” Colorado has failed to do so every year since 2011. As a result, we have created what is known as the “negative factor” — an I.O.U on K-12 education funding. This past fiscal year, Colorado was $672 million in the red on its constitutional obligation. This new budget puts $77 million toward that negative factor. That means even in one of the best economic times Colorado has seen decades, we’re still $595 million short on basic levels of education funding. A $100 million transportation compromise might fill potholes, but won’t fix your roads. As the budget moved through the Senate, a deal was struck to carve out an additional $100 million for transportation, which will amount to $336 million in transportation funding for this year. A $100 million increase would amount to about 1 percent of the estimated $9 billion project backlog in the state. Keeping tuition or funding levels flat is far from making child care and higher education affordable to Coloradans who need it. The over $120 million increase in higher education investment of the current budget is laudable. Unfortunately, to keep pace with pre-recession levels, Colorado would need to invest over $400 million. Moreover, to keep pace with investment levels from the early 1990s, Colorado would have to invest well over a billion dollars. Additionally, while budget increases in today’s budget help maintain current levels of child care subsidies, they don’t move Colorado toward universal access for preschool and proportional coverage for child care among families of different incomes. Higher education reinvestment. A $121 million, or 11 percent, increase for higher education holds tuition flat for all public higher education institutions with one exception — Metropolitan State University. This is the largest investment in higher education the state has made in years. This is good news for Colorado families who have seen the cost of higher education double over the last 20 years, while the state’s share has been halved to one-third of total tuition. Full-day kindergarten. With $185 million included for Governor Polis’s signature program, thousands more Colorado kindergarteners will have access to free, full-day kindergarten. Research suggests significant educational and social benefits for students in full-day, versus half-day kindergarten. Additionally, funding this program would eliminate the burden of paying high tuition rates, which is welcome news for many families struggling with Colorado’s high cost of living. Child care funded at current service levels. $10 million is budgeted to maintain current service levels in the Colorado Child Care Assistance Program (CCCAP). Inclusion of this funding will ensure many families who need child care assistance —including most low-income families in the state — can get it. Funding for training more Colorado workers. A 2.1 percent increase over the prior fiscal year, career and technical education funding will receive $27 million. This commitment demonstrates ongoing support for the types of training that give high school students critical opportunities to engage with industry, and earn skills and competencies that lead to postsecondary training and good jobs with high wages. Increased support for home-based and community services for seniors. A $10 million targeted rate increase for home-based and community service (HBCS) providers. Medicaid reimbursement rates for HBCS, which help many older adults age in the community of their choice, are far too low. Inadequate reimbursement rates are a key reason providers can’t pay direct service workers, like home health and care aides, competitive wages. In turn, these low wages make it difficult for the long-term care field to recruit and retain workers — even as we see increased demand for their services. Recognizing Colorado can help older adults age in their communities. $1.9 million in increased funding provides housing vouchers for Colorado Choice Transitions participants, which helps older adults and people with disabilities, who both want and are able to, transition back into their community after extended nursing home stays. As highlighted in our Best Practices in Aging report, states across the country have implemented successful programs with this goal. These programs recognize most people want to age in their own community and doing so is often less expensive than nursing home care. While there are many points of progress within the budget, we can still do more to expand economic mobility. Zero-sum game in higher education. The overwhelming need to prioritize means this new injection of funding — while significant — is still insufficient and below pre-recession funding levels. The state’s public higher education system houses a set of varied institutions, all of which deal with different student populations and needs, geographic constraints, and cost pressures. While this investment is important for all schools, it’s extremely important for smaller, shrinking schools like Fort Lewis College, which serves mostly in-state students and students of color. Impossibly tight state budgets have led to a zero-sum game within Colorado higher education, wherein even a $121 million funding increase fails to fully meet the needs of those institutions serving Colorado students. Child care funding still not serving all Colorado kids who need it. In 2018, CCCAP served 30,328 children, about 21.8 percent of those in families with incomes at or below 185 percent of the federal poverty level (FPL). JBC staff estimate 43,299 children would need to be served to reach rates that are the equivalent of families receiving child care within the overall population (about 31 percent). This means serving 12,971 more children in CCCAP — an additional 9.3 percent of those eligible. JBC staff estimates it would cost an additional $41.4 million to close the gap. While $10 million dollars in additional investments will keep service levels steady, it’s far below where it should be to serve all eligible Colorado children. An ounce of prevention is worth a pound of cure. Over the next 12 years, the state’s long-term care costs are “expected to more than double, reaching $1.5 billion in 2030,” says Colorado Health Institute. As discussed in our Aging Roadmap, investing in preventative care can help offset future costs. While this year’s budget takes steps to increase support for preventative services, it’s not enough. Colorado already has important and proven programs and initiatives which can meet the needs of our older adults. We must do more to support this ongoing work and leverage existing resources and programs to meet the growing needs of our aging residents and their caregivers. This year’s Colorado budget makes considerable and needed investments in important priorities like education and transportation. But with a constrained budget, these investments come at a cost. When we don’t have enough funds to properly invest in our future, inevitably important services like preventative care for Colorado’s older adults and their caregivers, higher education, and crumbling transportation infrastructure receive only partial repairs. Current efforts being considered by the legislature such as “debrucing,” or allowing the government to spend all the revenue current tax rates currently produce, is one step in helping make investments to keep Colorado competitive. Based upon optimistic economic estimates from the Governor’s Office of State Planning and Budget, this could lead to close to a billion new investment dollars over the next three years. Unfortunately, if you are more skeptical and trust the economic estimates from the Legislative Council Staff, “debrucing” would only produce an extra $65 million over the next three years. Increasing investments in Colorado’s future is a good thing, but making a significant leap forward for our state will require larger efforts to increase revenue. © Copyright 2017-2019 The Bell Policy Center. Site designed by AlphaPixel Reach.